One day I’ll bake my own bread. And that will be all the bread we eat in our house. No more quick store trips for bread and milk. Instead it will be a run for milk and ice cream, so I can stay sane (and cool) as I bake away. Until that great baking day arrives however, I’ll be relying on some quality store brands. I’d like to be able to say that since I don’t bake my own bread, I only buy limited ingredient, wholesome bread from a local bakery, but that day has not arrived either. There’s certainly nothing wrong with buying bread at the grocery store, but I do recommend checking the labels carefully. The bread selection has become somewhat outrageous, and the manufacturers don’t make it easy to interpret their claims. Whole grain, enriched, multi-grain, whole white wheat, refined, 12-grain, 9-grain, 7-grain, and on and on. Whole grains make good nutritional sense, but how do you know what you’re getting? Step 1 – Be familiar with the definition. Whole grain simply means the entire grain is intact – bran, endosperm, and germ. The primary nutritional benefit is the fiber, but also the vitamins, minerals and antioxidants. Whole grains have been associated with increased fullness as well as lowered risk for diseases such as cancer, heart disease and diabetes. Step 2 – Know a whole grain when you see one. Go straight to the ingredient list on the Nutrition Facts label. If whole grain appears in the first ingredient, you are holding a whole grain product. The Whole Grains Council has created a whole grain stamp – yellow with black writing – that graces the packaging of many high quality whole grain products. Obviously the goal is to make the selection process easier and alert consumers to products that have met their standards. Typically I’d suggest ignoring the front of the package, with the exception of looking for the whole grain stamp. Step 3 – Trial different types of whole grain breads. Whole wheat bread is not the only type of whole grain bread available. Oats, rye (look for whole rye), millet and spelt (again, look for whole spelt) are also whole grains commonly found in breads. Now that the bread aisle is easier to navigate, consider whole grain options for cereal, bagels, English muffins, waffles, tortillas, crackers, rice, pasta or other grain items you enjoy. For all the whole grain info you could ever want, including this helpful A- Z list, visit the Whole Grains Council. This resource from Food Network is also helpful. If you’re adventurous enough to make bread at home, try the challah we blogged about last year! Do you make bread from scratch? 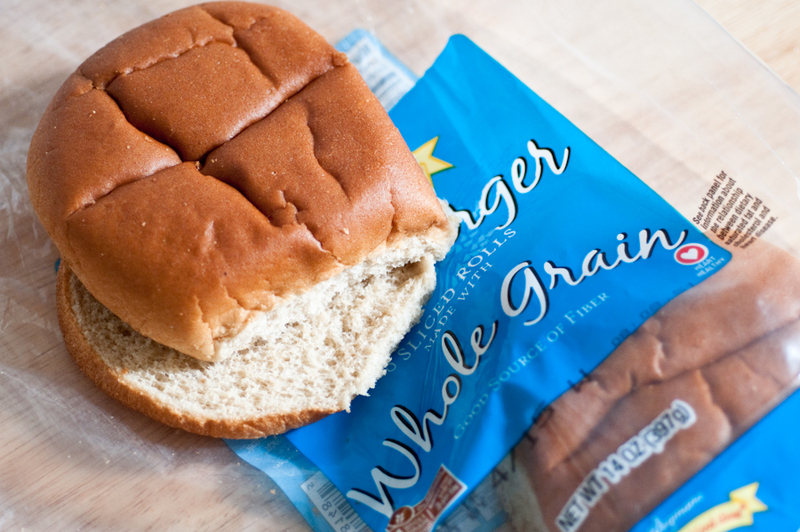 How important is it to you to purchase whole grain bread? All the bread we eat at home (not necessarily lunch/breakfast sandwiches) is homemade. I make a simple no-knead recipe that makes three smallish loaves at a time. I stick two in the freezer and leave one out. I usually use a combination of white and whole wheat flour so it isn’t too dense. Last time I used white whole wheat and regular white flour. The only ingredients are water, yeast, flour, and salt. <–that simplicity is my favorite part. At night, either before or with our dinner, we have a slice or two, usually after it's been zapped in the microwave for 15 seconds. It gives the several days old bread some new life. My mom used to make us all whole wheat in the bread machine in the 90’s. REPEATEDLY! So. Dense. I’ve done all white, white and whole wheat 1/2 and 1/2, and white and white whole wheat 1/2 and 1/2. Pretty much whatever is around. The longer you let it sit in the fridge, the more it gets ferment-y. I usually mix it up in the evening and let it sit on the counter for a few hours, then put it in the fridge and prep and bake a 2-3 days later. My sister sent me the “My Bread” book by Lahey and the cast iron dutch oven to go with it (both available on the cheap through Amazon) and it has CHANGED MY LIFE. No joke. I was not a break baker but, now? I bake break every week with this no knead method. It’s brilliant. The secret is a long rise. I’ll start the dough (bread flour, salt, yeast, and water) one night, and finish the bread the next night and it produces this fantastic boule that is every bit as good as the high prices artisal style bread at the grocery store. It’s saving us bucks and I’m so freakin’ proud of how it comes out! Not high prices, high priced. You see? I have no patience for detail. If the recipe wasn’t easy, I would have given up on it long ago. Thanks for the great ideas! You’ve inspired me to work harder on the bread baking goal. I’m going to Amazon right now to look at that book!